You can edit multiple issues in your plan, so you don't have to make the same change for several issues over and over again. This section applies to issues that have never been assigned to a team, or issues that you want to reassign to a different team. In the scope section, select the checkboxes for the issues you want to assign to a team. Click the Bulk actions menu > Team. The Bulk actions dialog will be displayed. Choose the corresponding team for the selected issues. Click Apply. The issues will be assigned to the selected team. Note that the issues will remain selected in the scope section. Make sure the checkboxes for the team changes are selected, then click Save selected changes in Jira. In the scope section, select the checkboxes for the issues you want to remove from the plan. Issues that are already saved in Jira will be removed from the plan, but will remain in Jira. Issues that aren't saved in Jira just yet will be permanently deleted from the plan. To edit the release of multiple issues, the issues must belong to the same project. In the scope section, select the checkboxes for the issues you want to edit the release for. Click the Bulk actions menu > Release. The Bulk actions dialog will be displayed. Choose the corresponding release for the selected issues. Click Apply. The issues will be added to the selected release. 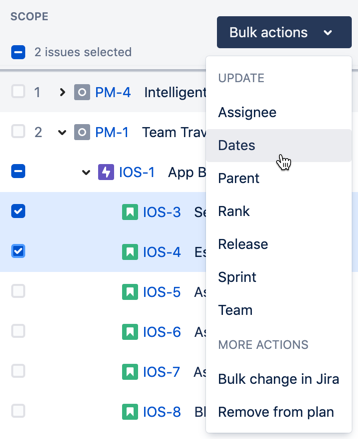 Make sure the checkboxes for the release changes are selected, then click Save selected changes in Jira. To move multiple issues to a new parent, the issues must be of the same hierarchy level. Also, issues of the highest level in the hierarchy can't be moved to a new parent since these issues can't be moved any higher. Click the Bulk actions menu > Move. The Bulk actions dialog will be displayed. Choose the corresponding parent for the selected issues. Click Apply. The issues will be moved to the selected parent. Make sure the checkboxes for the parent changes are selected, then click Save selected changes in Jira.